Posted on Monday, July 5th, 2010 at 9:45 am. Club President Pat Nixon had an accident at the end of 2009 which necessitated her being lifted by one of the Midland Air Ambulances. She was clearly very grateful for their help and was delighted when one of our members Marcia Haden and her husband John offered to do a sponsored walk for their funds. 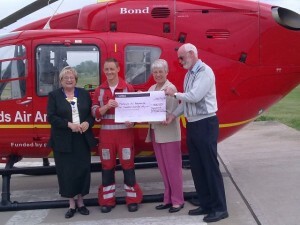 An amount of £400 was raised and a presentation was made at RAF Cosford which is the headquarters of Air Ambulance Midlands. One of their representatives also attended the June Supper meeting to talk about the work and fund raising of the organisation.